Definition of High frequency welding in using external pressure together with electromagnetic energy heating to create welding of plastic materials. This method can be used to weld sheet and soft cloth-like polymer. It has remarkable high advantage on preventing cracks on the plastic sheets and strengthening the application. 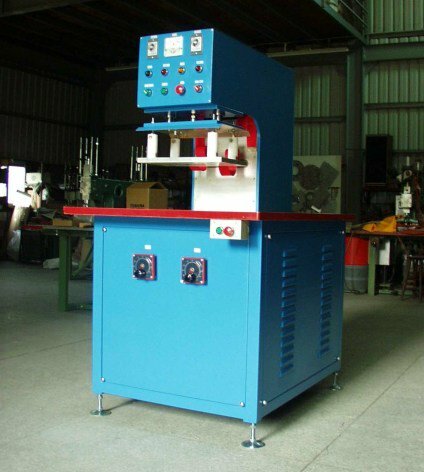 Hexagon Electric is able to supply wide demand of customized machines, please contact us. Keywords: PU PU hot-melt adhesive high-frequency high-frequency bonding plastic sheets embossed PU Foam PU PU waterproof membrane fusion frequency high frequency high frequency voltage hot-melt coating PU PU PU laminated high-frequency high-frequency hot press fit PU brand PU synthetic leather uppers High Frequency High Frequency Embossing.